Living in Minnesota in the winter represents several challenges, but that large accumulation of snow on your roof can expose every homeowners worst nightmare….Ice Dams. The first sign of an ice dam issue is icicles hanging from the edge of your roof. At this point you need to call a professional that will assess your issue and provide the necessary solutions to your problem. Minnesota Remodeling Solutions has the experience necessary to handle your Ice Dam Removal in Maple Grove MN. Ice Dams form when there is indoor heat loss through the attic, which causes the snow to melt on your roof and flow down toward the eave. 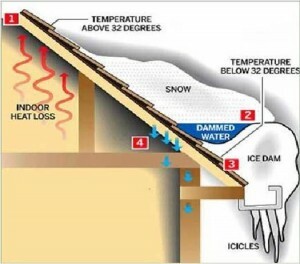 An ice dam then forms and water builds up behind the dam and seeps into your home. Once we resolve issue we educate you on the steps necessary for preventing future problems to your roof. Contact Us today and we’ll help you with your Maple Grove Home! Contact us, a reliable roofing contractor, when you first see signs of an ice dam forming. Getting ahead of the issue can save you money and headaches when it comes to your roofing. Visit www.mnremodelingsolutions.com/ for additional information regarding your ice dam issue. Find out more about roofing ice dams.